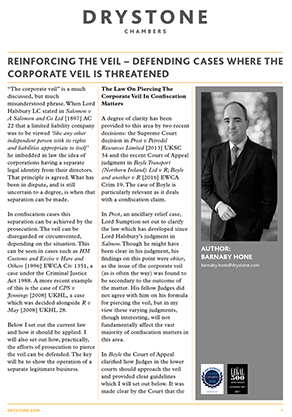 The following article by financial crime specialist Barnaby Hone explains the current law surrounding ‘the corporate veil’, setting out in practical terms how to defend when prosecuting authorities attempt to pierce the veil within confiscation proceedings. He explores three possible defence strategies and takes a closer look at how practitioners might use current law to the advantage of the defence case. Barnaby has a range of experience in fraud, international asset recovery, financial crime and professional discipline law, particularly in healthcare and sports law matters. He has experience of all areas of the Proceeds of Crime Act both domestically and internationally.